NEW: Secretary of State Clinton: North Korea is "a matter of great concern"
Clinton: Missile launch would be "very unhelpful in moving our relationship"
SEOUL, South Korea (CNN) -- U.S. Secretary of State Hillary Clinton arrived in South Korea on Thursday on the third leg of her four-nation tour of Asia. Hillary Clinton has said any North Korean missile launch would be "very unhelpful" to relations with the U.S. Speaking with reporters aboard her plane en route to Seoul, South Korea, Clinton commented extensively on the increasingly tense relationship between North and South Korea. She said she will be receiving briefings in Seoul by the U.S. military and their South Korean counterparts on their assessment of the North's recent actions. The visit comes at a time of escalating tensions on the Korean peninsula and after U.S. officials cited evidence that North Korea was gearing up for a launch of a long-range missile. North Korean officials have disputed the claim, saying in the country's official news agency that Pyongyang was preparing to launch a satellite. Seoul called the North's statement a repeat of past bluster. Clinton called the potential launch "a matter of great concern." She said she wants to hear directly from the leadership of South Korea and China, which she will visit after Seoul, on what they think should be the next steps in dealing with the North. "We obviously do have some ideas. ... But we do want this to be shared responsibility." "Everybody is trying to sort of read the tea leaves on what is happening and what is likely to occur," she said. There is increased pressure, Clinton added, because of questions over succession issues for the North's leadership. North Korean leader Kim Jong-Il has reportedly had a stroke and some observers claim he may not be fully in charge of the country. 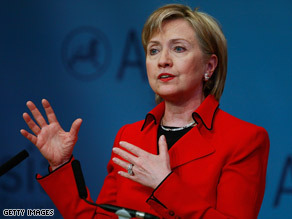 "If there is a succession," Clinton went on, "even if it is a peaceful succession, then that creates more uncertainty. It may also encourage even more provocative action as a way to delegate power within the society." "Our goal is to try to come up with a strategy that is effective in influencing the leadership of North Korea at a time when the leadership situation is somewhat unclear." The secretary of state said the aim now is to rebuild the commitment by the U.S., Russia, China, Japan and South Korea into a "united front" to deal with the North. Talks among those nations, she said, have produced some results, "but we are still dealing with the reality of North Korea not only possessing, we believe, some number of nuclear weapons, but showing very little willingness to get back on track." Asked about the worldwide economic crisis, Clinton conceded that some countries blame the United States. She said it is important for the member nations of the Group of 20 -- a forum of the world's biggest developed and developing economies -- to come up with a positive program to deal with the crisis. "It's not like the U.S. saying, 'You do what we do.' It's saying, 'Here's what we're doing to clean up our own mess, and this is an important moment for all of us to act and do what we can.' "
Her trip represents a departure from a diplomatic tradition under which the first overseas trip by the secretary of state in a new administration is to Europe.